Print your logo onto these custom printed 6 pack lunch cooler bags or one of our other innovative cooler bags & eskis and use them in your next marketing campaign as a unique giveaway item. These handy Cooler Lunch Bags are a must have branded gift. They will be used everyday and are PEVA insulated. they have a zippered main compartment an open front pocket with a 21 inch handle. Made from: 210d Polyester. Colours: Black, Hunter Green, Lime Green, Orange,Pink, Purple, Royal Blue, Red, White, Yellow. 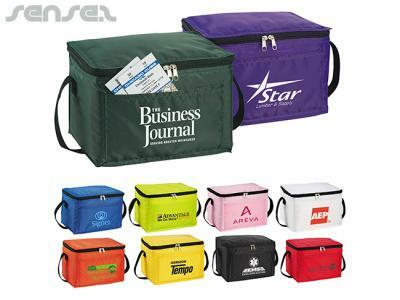 Personalise your 6 pack lunch cooler bags or custom design cooler bags & eskis for your marketing campaign. How can these unique promotional 6 pack lunch cooler bags or our personalised cooler bags & eskis fit in with your marketing strategy and help you maximise your brand exposure? Our custom made 6 Pack Lunch Cooler Bags can be produced from a minimum quantity of 100 pieces. We can have your logo branded on these corporate 6 Pack Lunch Cooler Bags in 1 Colour Pad Print. A setup fee of NZ$191.00 will apply to make the film.